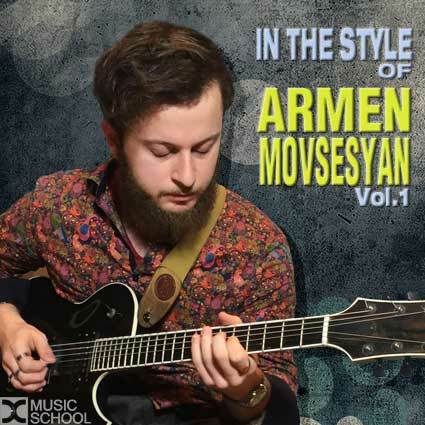 An in-depth study on the Jazz style of guitarist Armen Movsesyan. Please note the special pricing system. For more information, please consult the FAQ for more information. All updates are free of charge once you purchase, even at the discounted price! Please also consult the notice above, for info on updates, if any. -Lessons where Armen shares his approach to music. -Includes downloadable mp3 of all lessons and etude performances. The In The Style series focus strictly on the playing style of the artist. These are not general "how to" lessons. The goal of these lessons is to give insight on a wide range of topics relevant to the musical style of the artist. Advanced students will be able to immediately absorb and work on many of the concepts covered in the lessons. Beginner and intermediate level students will benefit greatly from the transcriptions of the numerous video performances with close ups when relevant. Music is like a language, and it is best learnt by surrounding yourself with better musicians. The goal of the "In The Style Series" is to give you this access, as much as possible, in the comfort of your own home! Movsesyan was exposed at an early age to traditional folk music. from around the globe while playing the guitar inspired Movsesyan to start writing songs at 15. Later at the University of Southern California, Movsesyan got into jazz and hasn’t looked back. The music that Movsesyan writes now is a combination of jazz, metal and other fusion styles. He hopes to continue playing the music that he loves and perhaps even making a little money on the side. IMPORTANT: Please note that these are streamed videos. Downloads, if any, will be found under the DOWNLOADS section. When access is purchased, you will have permanent access to this lesson, and all updates/corrections (if any) will be free of charge! When you buy this, you’ll get instant access to everything. Our videos will play directly in your web browser — there is nothing to download or install. It works on tablets and smartphones, too. Note that videos cannot be downloaded. Questions? Contact us any time. Store About FAQ Contact © 2017 DC Music School. Powered by Soundslice.